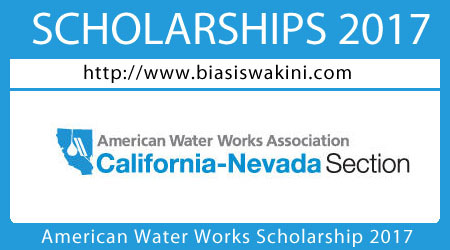 The California-Nevada Section of the American Water Works Association is offering both undergraduate and graduate scholarships 2017 for the 2017-2018 academic year for students interested in a career in a drinking water related field. • Two (2) $1,000 One AWWA Operator scholarships Undergraduate scholarships are applicable to community college or four-year college programs, including (not limited to) water/ wastewater treatment plant operator, field/ distribution system operator, chemistry or lab tech, biology/ecology, environmental or civil engineering, mechanical/electrical/plumbing trades, etc. Graduate scholarships are for students pursuing advanced education suitable for a career in drinking water, including (not limited to) environmental or civil engineering, chemistry, environmental sciences, public administration, finance/economics, etc. 0 Komentar untuk "American Water Works Association Scholarship 2017"